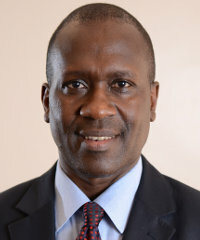 James Omwando is the CEO of KK Group of Companies. The group provides private security services in Kenya, Tanzania, Malawi, Democratic Republic of Congo, Rwanda, Uganda and Burundi. I worked as an election clerk. I was in high school at the time. After I graduated from university I worked as an accounts clerk at American International Group (AIG). The management skills I have today I leant at AIG. Incidentally our chairman was also at AIG; he was the managing director when I was an area manager. I think the chairman of KK Group of Companies [Derek J. Oatway]. I have known him since I was 20. I have made mistakes or said things or gotten angry and asked him how he could allow a particular thing to happen. But he would always tell me to look at it from a different point [and] quite frankly I get shocked when I realise later that his suggestion was right after all. There is a guy in our organisation who if he calls you at night you know there is trouble. [Once] when I was based in Mombasa he rang me at night… [because] our employees had responded to an alarm and… they were killed. That was very devastating. These are people you know and see every day. If there is a crisis I don’t panic. You know that you will do your best but if you can’t do more than that then you couldn’t do it. 5. What are the best things about your country? Kenyans are resilient and they are proud. We are a bit aggressive as well. Kenya is a special country in many ways. Corruption. It’s bad. I don’t believe if we were less corrupt we would have the problems we have with security right now. Our borders are porous because of corruption. I want to get into real estate. I enjoy construction. I like seeing things happening. I like seeing my ideas coming into fruition, into something tangible. I seriously have a passion for real estate. I play squash occasionally. I have a drink with my friends and over the weekends I spend time with the kids. I try to have a good balance. They should not be in a hurry. Youth today want success yesterday. They want instant success. I think patience pays and learning from the old is important. Experience is not something you can get in school; you just have to go through it. There is [only] so much that books can teach you. I think we are reaching a time [in Africa] where entrepreneurship is the way to go. Start something that you will nurture yourself. There should be unity. We should avoid these trade restrictions within ourselves in Africa. We should make cross border trade easier. If people in Uganda can easily get involved in business in Kenya, for instance, I believe it would be easier for Africa to be self-reliant. I am the owner wise auto motors ltd my workshop situated in industrial area Nairobi along Kenya pipeline, Nestle Kenya ltd. i repair vehicles mechanical ,panel beating and spray painting. I maintain government vehicles and company vehicles.